I am teaching my Church Young Women’s group about why it is important to keep our body’s healthy. I am really excited to teach this because I am a huge believer of keeping a healthy and balanced life to achieve a sense of happiness and wellbeing (See post about healthy body here). Practicing good health is vital to Keeping the ‘delicate, sensitive, spiritual of our nature on proper alert’ as Body K. Packer states. It helps us feel the Spirit more clearly and fully in our lives. I have found that striving to maintain the spirit in my life by practicing good health, care and respect for my body has truly brought a flood of wisdom, inspiration, calmness, peace, happiness more than I could ever imagine. Being sensitive to the Spirit also provides the balance we need so we don’t go overboard on any aspect of our lives. I have learned, it really is the ‘Word of Wisdom’. I wanted something the girls could really ‘take home’ and practice. 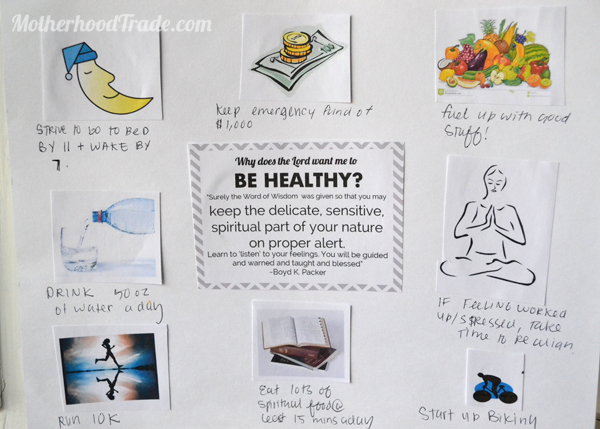 I gathered some images from the internet of things that could represent areas of health: Physical, emotional, mental, spiritual even financial well being so they could create a Health Vision Board. I’m a believe of vision boards because they tie in the verbal and visual parts of our brains. The idea is to put the board on the wall next to their beds where they can see it as soon as they roll out of bed. Their job is to look at every part of the board every morning (and often as they like) and really take in. The idea is the more they internalize what is on the board, the sooner and easier their minds will make sure it gets done! I’m about forming habits and disciple (see my 7 tips of success here), so this way, if they missed doing something for a couple days to NOT GIVE UP! You are DEVELOPING habits, so it is ok if you don’t do it all right away, but the board provides the VISION of what it is you really want to keep working on. 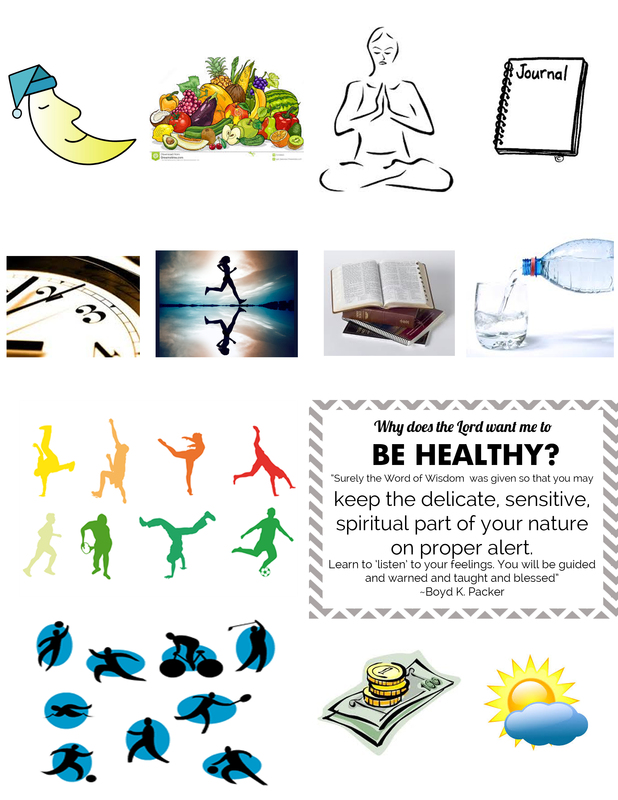 Here is the vision board handout they can cut and glue on a regular 8.5×11 piece of paper or cardstock. Hope it helps! Previous Previous post: Feeling good enough. Next Next post: How to manage emotions in a healthy way.